The popular shandy takes on a dark, fruity twist in the cranberry-ginger shandy. It's a simple recipe that turns the summer drink into the perfect beverage for autumn and winter parties, and it's incredibly easy to make. The pitcher drink will create four 12-ounce servings, but you can always pour shorter drinks or mix a larger batch for more guests. Spicy ginger beer and tart cranberry make this shandy unique. A little lemon juice adds a bright accent and a ginger-sugar rim makes every sip spicy and sweet. Finally, it's all topped off with beer for the full shandy treatment. Hefeweizen or another wheat beer is ideal with this flavor combination, but you can also pour your favorite pale ale. The lightest beers, like lagers, may not hold up to the darker fruit (save those for citrus shandies). 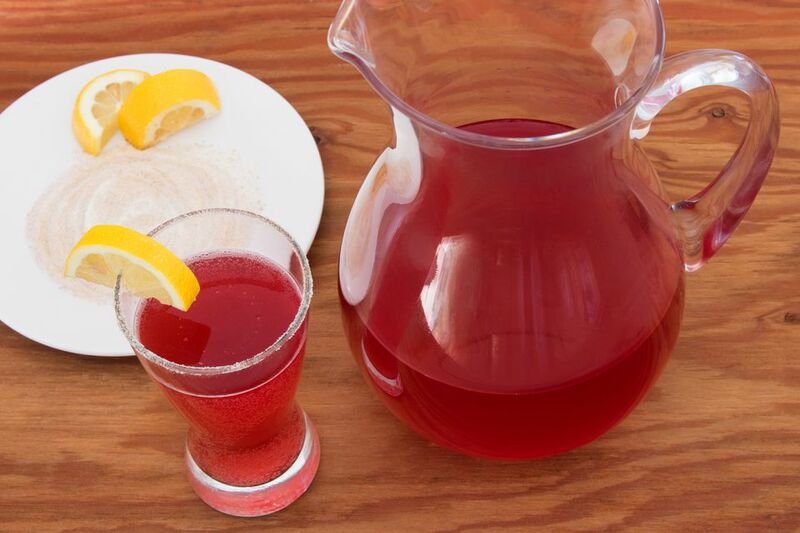 In a large pitcher, combine the cranberry juice, ginger beer, and lemon juice. Stir well. Chill until you're ready to serve. Before serving, rim tall glasses with a ginger-sugar rim, wetting the rim with lemon juice and rolling it in a mix of ground ginger and sugar. Add beer to the pitcher just before serving. Pour the shandy into the prepared glasses over ice, if desired. Garnish with a lemon wedge. To make ginger sugar, combine 1 part white granulated sugar with 1/2 part ground ginger. Mix it well until you get a uniform light brown color. If your shandy is chilled, there's really no need to add ice. The other option is to add ice to the pitcher. Don't mix it up too early or you will lose some of the effervescence from the beers. You can also hold the beer, then top each glass with freshly tapped beer. You will need two whole lemons to get 3 1/2 ounces of fresh-squeezed juice. Make as much or as little of this drink as you need. Simply keep the ingredients in proportion: 1/2 part each cranberry juice and ginger beer to 1 part beer. For a single drink, a squeeze of juice from a lemon wedge is perfect. Give the shandy a kick by adding a shot (1 1/2 ounces) of whiskey or vodka to each glass. Toss a couple of cinnamon sticks into the pitcher and let the flavor infuse into the drink for a few minutes to add a little extra spice. Cinnamon can also be added to the individual glasses. How Strong Is a Cranberry Ginger Shandy? This is one of the lightest mixed drinks you can make because you're essentially cutting the beer's strength in half. The lemon juice is a factor, too, so the alcohol content ends up as a very mild 2.3 percent ABV. There's very little worry about your guests becoming drunk off this one!